PRC Members Hold Spring Meeting in D.C. 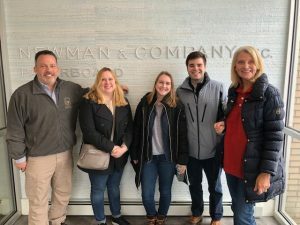 Senator John Boozman (R-AR), Co-Chair of the Senate Recycling Caucus’ staffer Jace Motley enjoyed learning more about the manufacture of 100% recycled paperboard at Newman Paperboard in Philadelphia. Also in attendance were Avery Mulligan, EPW staff for Senator Tom Carper (D-DE) and Laura Pickard of the American Forest & Paper Association. Pictured from left to right: Michael Ferman, Newman Paperboard; Laura Pickard, AF&PA; Avery Mulligan, Committee on Environment & Public Works; Jace Motley, Office of Senator John Boozman.